Well, Emma Stone didn’t get an Oscar nomination. Shocker. It’s unfortunate because – get this – I think she gave a better performance than Annette Bening AND Jennifer Lawrence, both nominated actresses this year. It’s just another tough year for comedic actresses, who fare only slightly better than Christopher Nolan nowadays. A truly comedic performance is rarely nominated, probably around once or twice a decade. We technically classify some performance as comedic – Meryl Streep in “The Devil Wears Prada,” Philip Seymour Hoffman in “Charlie Wilson’s War,” Alan Arkin in “Little Miss Sunshine,” Keira Knightley in “Pride and Prejudice,” Kate Winslet in “Eternal Sunshine of the Spotless Mind,” to name a bunch – but these are really just light-hearted dramatic acting in movies with some laugh. In my Oscar Moment about “Easy A,” I didn’t offer any hope that Emma Stone would be nominated; in fact, I didn’t even ask the question in my poll. I defended the award-worthiness of comedic actors and actresses, saying that they excel in a very different kind of acting that requires a different but still challenging set of skills. My poll asked voters whether they thought comedic actors deserved to receive Academy Award nominations. The results were overwhelmingly in favor of actors like Stone receiving nominations. Nearly 90% of voters replied that they think that comedic actors ARE deserving. I don’t think that Emma stone’s snub represent a sort of “last straw” for audiences in the consistent overlooking of comedic actors, but I do hope that the unofficial policy gets some serious thought soon. There was a time when “Another Year” seemed like not only a sure-fire Best Picture and Director nominee, but a legitimate threat to win them both. That was back in the summer after the Cannes Film Festival when it had all the buzz. Fast forward two seasons and Mike Leigh’s movie is on life support, barely breathing in an awards season that has given the movie little love other than for Lesley Manville from the BAFTAs and National Board of Review. Mike Leigh’s direction and writing have gone basically unnoticed. Now, the movie hopes to draw enough support from the Mike Leigh-loving Academy voters to get a nomination and salvage itself. I can’t say whether or not the movie merits a nomination as it has yet to open in Houston. But I can tell you that its prospects are slim. The poll voters were split back then with half thinking it would be Leigh’s time and half thinking it wouldn’t be. Four months later, it seems almost certain that it will NOT be Leigh’s time. I enjoy looking back and seeing what the race could have been. But with the campaign in high gear, she seems to be making a mark. So back in December, I polled readers on an Oscar Moment, asking them if they thought Weaver would receive an Oscar nomination. The jury was in favor of Weaver as both voters said she would be nominated. If I were an Academy member, I wouldn’t vote for her. But I’m not an Academy member, and I think she will probably make it. But I’m not confident or positive in that assertion. So I’m a little upset that it has flown under the radar all season with the exception of Nicole Kidman’s moving work. 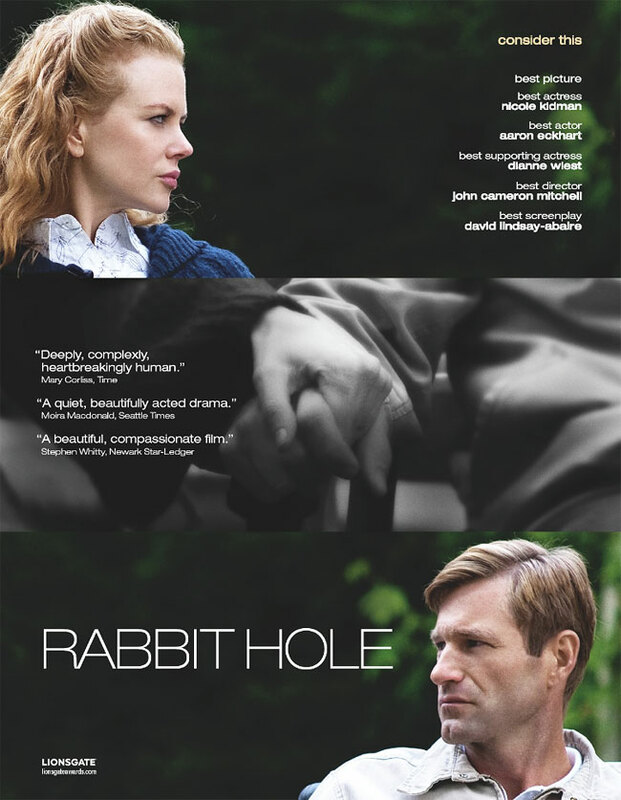 Aaron Eckhart and Dianne Weist both turned in astounding, Oscar-worthy performances as well. The movie itself deserves to pop up in the expanded Oscar Best Picture field. But alas, my hope is in likely in vain. Despite the one voter in the poll who said it would be nominated for Best Picture back in October on my Oscar Moment about the movie, it just doesn’t look likely. Anything is possible, I suppose, but this would make “The Blind Side” look like an expected nomination. “The Way Back” opens nationwide today with no Oscar buzz to bolster box office numbers. Given the tough subject material – an escape from a Siberian goulag and the long, dangerous walk home – Newmarket probably should have released this earlier. But they opted for the qualifying run strategy, which worked for “The Last Station” in 2009. However, it doesn’t look like it will pan out for Peter Weir’s movie for any nominations, least of all Best Picture. There is no indication that much love for this movie exists at all – no critics listed it, and no guilds have shown support. Heck, it’s entirely possible that most of the Academy voters haven’t even seen the movie. The results from the poll I placed on the Oscar Moment back in November don’t seem to echo the obvious truth about the movie now. Both voters (as in two) said they think the movie would be nominated for Best Picture. I think that only in an incredibly dark horse scenario would that happen. Michelle Williams and Ryan Gosling, the stars of “Blue Valentine,” both missed out on Golden Globe wins and BAFTA nominations. But will both, one, or neither get Oscar nominations? Perhaps it’s time to check the poll! There were five voters in the poll, and none of them thought that Ryan Gosling alone would get nominated or that neither of them would get nominated. However, 40% thought Williams alone would receive a nomination. In my opinion, she was the better of the two, and I’d much rather see her get nominated than her co-star. 60% of voters thought that both would get nominated. I think what could end up hurting “Blue Valentine” in the end is that it’s like a combo deal: you can’t nominated one without the other. I feel like it’s more likely to see both left off than one put on. Williams has a better shot than Gosling at a nomination, but I feel like her fifth slot is ripe for a surprise nominee like Hailee Steinfeld, Noomi Rapace, or Julianne Moore (!). Javier Bardem got a BAFTA nomination for “Biutiful!” That’s just about his first significant mention of the year! Perhaps all is not lost on the horse Julia Roberts has vocally and publicly backed. Yes! Both voters (both as in there were only two) thought that Bardem would get a nomination. My predictions (basically final) will be announced on Friday, and don’t expect to see Bardem in there. But the BAFTA nomination was a big boost, and I’m definitely taking him more seriously as a contender thanks to it.